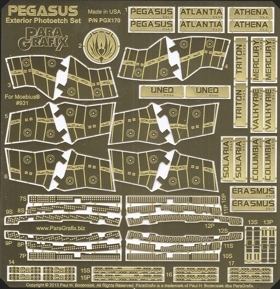 Add super-fine details to the exterior of Moebius Models' Battlestar Pegasus kit. Two different sets of "head" inserts to take away the smooth appearance. Panels to supply missing details on the "'tween deck" area of the two landing bays. Paneling detail for the sides of the landing bay support arms. Raised detail for the Colonial Fleet emblem that matches the kit decal. Click Here for photos of the prototype etch in action.